Girls everywhere are going gaga for Juicy Couture's fun, feminine bags. Even Hollywood style icons like Nicole Richie, Jessica Alba, and Jessica Simpson say they love these classy but casual handbags. The Daydreamer has all the marks of a classic Juicy Couture bag. 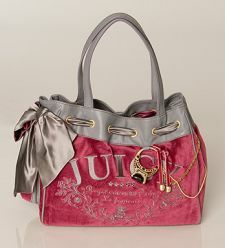 It's made of ultra girly berry red velour and classic gray leather. For an extra dose of femininity, the tote is finished with an oversized satin bow and large gold-tone ring charm. Your friends will all know this is an authentic Juicy Couture design, with the Juicy logo embroidered on the front and the cute "J" heart on the back. This Daydreamer regal design is fit for royalty! Juicy Couture Crown Cosmetic Bag | Berry Burgundy and Berry Cute!